Georg Cassander was an outstanding Catholic scholar. He was born 24 August 1513 at Pittham near Bruges and died in Cologne on 3 February 1566. He was noted for his exceedingly rare tolerance toward persons of other faiths. He was frequently used to convert Anabaptists, as in the case of Johannes Campanus, and especially of Matthias Servaes. The latter portrays him in his letters (Martyrs Mirror) as a man little and feeble of body, who . . . laid many little snares, to take captive my mind." In his Opera, published in Paris in 1616, Cassander presents two extremely interesting conversations with Servaes (Rembert, 476, note 4). He was obviously deeply impressed by Servaes' faith, firmly rooted in the Bible, and by his constancy in the face of death. He deeply regretted that the imperial laws inexorably demanded the death penalty for the young Anabaptist, and believed that the Anabaptists should be converted by teaching and instruction rather than punished with the sword. Summoned by the Duke of Cleve, Cassander went to Duisburg to convert the Anabaptists (Ottius, Annaies Anabaptistici, 122). To this end he wrote a pamphlet on infant baptism, which he read to Servaes. He mentioned another booklet he wrote to combat the Anabaptists with the title, Libellus Adversus Anabaptistas (Rembert, 546, note 6). Because of his pacific attitude Ferdinand I called him to his court to assist in the task of reconciling the creeds, but it did not take place. Cassander's influence was not of long duration because his position lacked definiteness. Hege, Christian and Christian Neff. Mennonitisches Lexikon, 4 vols. Frankfurt & Weierhof: Hege; Karlsruhe: Schneider, 1913-1967: v. I, 334. Herzog, J. J. and Albert Hauck, Realencyclopedie für Protestantische Theologie and Kirche, 24 vols. 3rd ed. Leipzig: J. H. Hinrichs, 1896-1913: v. III, 742 f.
Nolte, M. Georgius Cassander en zijn oecumenisch streven. Nijmegen, 1951. Rembert, Karl. Die “Wiedertäufer” im Herzogtum Jülich. Berlin: R. Gaertners Verlagsbuchhandlung, 1899. Schijn, Hermann. Geschiedenis dier Christenen, welke in de Vereenigde Nederlanden onder de Protestanten Mennoniten genaamd worden . . . Tweede Druk op nieuws uit het Latyn vertaald, en vermeerdert door Gerardus Maatschoen. Amsterdam: Kornelis de Wit, 1743: 287. Vos, Karel. 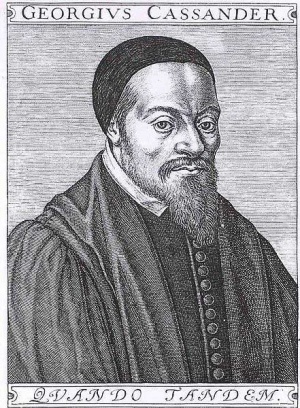 Menno Simons, 1496-1561, zijn leven en werken en zijne reformatorische denkbeelden. Leiden: E. J. Brill, 1914: 315 f.
Zeitschrift des Bergischen Geschichtsvereins (Elberfeld, 1899): 2 ff. Neff, Christian. "Cassander, Georg (1513-1566)." Global Anabaptist Mennonite Encyclopedia Online. 1953. Web. 20 Apr 2019. http://gameo.org/index.php?title=Cassander,_Georg_(1513-1566)&oldid=144926. Neff, Christian. (1953). Cassander, Georg (1513-1566). Global Anabaptist Mennonite Encyclopedia Online. Retrieved 20 April 2019, from http://gameo.org/index.php?title=Cassander,_Georg_(1513-1566)&oldid=144926. Adapted by permission of Herald Press, Harrisonburg, Virginia, from Mennonite Encyclopedia, Vol. 1, p. 522. All rights reserved.